Technology and rapid mass transit – including the potential of tunneling under the city – could provide a solution to Greater Cambridge’s growing congestion issues in the future – Greater Cambridge Partnership’s Chief Executive Rachel Stopard. The event talked about technologies that could influence transport efficiency. These included autonomous pods, which are already being trialled on Cambridge’s guided busway, as described by Richard Fairchild of RDM, and drones, demonstrated by Nathan Wrench of Cambridge Consultants. 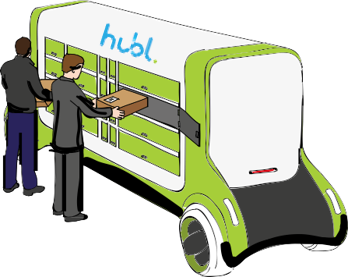 Hubl is the ultimate ‘last green mile’ logistics fulfilment system. It focuses on providing a superior delivery service to inner city householders and businesses, way beyond what is currently available. 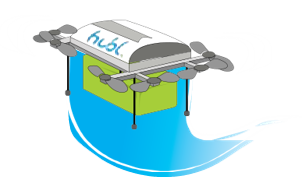 With a vision of driving the world of delivery to a brighter future, Hubl aims that e very major city in the UK (and eventually worldwide) will use its ‘last green mile’ premium delivery system to create a customer-focused, timed delivery service while significantly reducing inner city pollution, congestion and road damage. By ‘last mile’ we mean the supply chain management and transportation planning to deliver goods from a transportation hub on the outskirts of a city to a destination of the home or business of an inner-city customer on a timed basis via a custom mobile app. By ‘green’ we tend to imply the use of advanced last-mile logistics and multi-modal delivery vehicles to effectively help minimise congestion, carbon emissions, air and noise pollution in the city. We are an environmentally-friendly last mile logistics network that combines best practices freight consolidation and delivery to collection points with low emissions vehicles. Hubl’s network will provide a high level of service to both B2C and B2B markets. Improve delivery services to consumers. Offer a range of value-added services to retailers. Cut delivery costs to carriers. Reduce congestion and pollution in cities.